When was the last time you bought a compact audio disc (CD)? I just can’t remember when I’d actually bought such an audio CD – maybe 2003 or 2004. These days I only receive them a gifts on special occasions or when the content isn’t available anywhere else (such as this nice Mendelssohn recording as pictured below). Today’s customers apparently prefer their audio entertainment to come in a digital format that can be copied onto a portable device and carried around. Sure, you can rip an audio CD and convert it into any popular digital audio encoding format, such as mp3. But then, also, there this study somewhere on the internet which concludes that many consumers these days don’t go for complete albums, but instead download single tracks online, either free of charge, for a fee from online shops like iTunes Store or illegal via P2P networks. I’ve also changed my consumer behaviour on audio entertainment some years ago – as I saw my shelves filling up with CDs that needed storage space. What if I had everything (every single CD) ripped and converted into mp3 format for use on my portable mp3 players and on my computer? I don’t want to own many different physical pieces of recorded media (the CDs), but instead just want to listen to my music. So I did that and now only have a small 2,5″ external hard drive with all my music on it. And since I am not a big fan of iTunes or iPods, I just slot the above pictured microSD card into the reader (attached to the keychain), plug it into a free USB port on my computer and load some music on the card which I can then use on my Nokia N95 mobile phone (which also serves as my mp3 player). You may have heard that SanDisk – the manufacturer of these tiny memory card – has meanwhile come up with the idea of selling DRM-free mp3 files preloaded on such a microSD card, marketed as slotMusic. 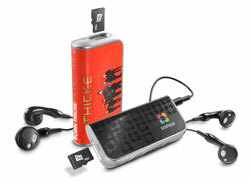 And since not everyone ownes a microSD-compatible player, they’ve introduced a simple mp3 player – the slotMusic player – which may also be branded for popular artists. To push this new format forward, Sandisk also secured support from all four major music labels (EMI Music, SONY BMG MUSIC ENTERTAINMENT, Universal Music Group & Warner Music Group). It will be interesting to see how consumers will accept this medium and how it will substitute audio CDs. I think, many consumers just want to enjoy the music they’ve bought – either in an old-fashioned way (vinyl, CDs, cassette tapes) or in a truly digital format that’s playable on many different devices and may even be copied. 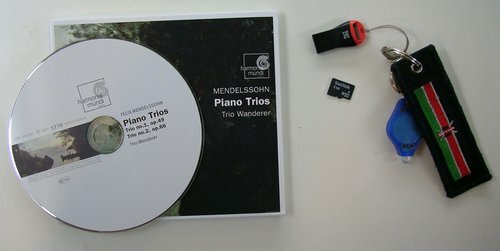 1 GB microSD cards currently sell for about 3,- EUR in Europe, come at the size of a fingernail, are hot-swapable (the keychain adapter is so sweet! I always keep a LinuxLive version on that 2 GB card) and still offer more memory space than conventional audio CDs. Also, since even a 1GB microSD card is big enough for audio AND additional files, I think the real innovation here isn’t about giving consumers just another media format, but instead the provision of additional memory space which may then be used for videos or flash animations that can even be played on a portable player. So it’s not only about music, but the extra data contained on such a device that will probably attract customers in future and make the difference. I know we also had VideoCDs or enhanced mutimedia CDs in the past, but nowadays many portable devices are also capable of playing any additional data (such as flash animations, text, videos, etc.) – so for the first time, this additional feature really makes sense. From what I’ve read on the blogosphere and seen on TV about SanDisk’s slotMusic approach so far, many ppl are still sceptic as they are currently used to downloading their music directly online, or prefer a CD which they can play on their stereo systems at home. Also, since these microSD cards are really tiny and all look alike, it will be particularly interesting to see how SanDisk will solve these still open issues. For me as a consumers though, this new format is much sweeter than conventional CDs – also since I already own a device that has a microSD card slot. I am currently using an 8GB microSD card on my N95 – and if I ever need more, I’ll just get another one. Getting the music transferred on such a card is just a matter of a seconds, which is quite convenient if you directly compare that with devices that only have a fixed memory chip (iPhone, iPod, Nokia 6500, and most older mp3 players). Interesting. I do like the idea of moving to different storage options. The cost is coming down too. VERY informative post (as always) — thanks K1! I was thinking about this subject recently, as I too haven’t *bought* a full music CD since 2004 (Angie Stone – Stone Love, which had to be punked so that MediaMax MALware would not get installed on my ‘puter). My CD collection is now in several vertical racks which act more as conversation pieces, than useful physical media storage. My “concern” about compressed music files is that I have no control over the format or settings. I prefer OGG at 128kbp or lower for my PDA, and higher bitrates for my ‘puter. I can only make adjustments if I can get the uncompressed file. I don’t see anyone actually selling WAV music files, OR giving many options for choosing the bitrate. Thx! Yes, you are right – the bitrate conversion is still an open issue. I have to admit that I am an average “joe the listener”-user who’s fine with 128kbp in mp3. At this relatively low price, I am also really tempted not to buy more 1GB cards and use them for different Live-Linux version (e.g. ophcrack :-).